Yes, I don’t know and no. Margaret and I are undertaking a cycling adventure around northern Vietnam for 14 days. Our goals: bike as much as possible, see rural Vietnam and have a good time. It’s as simple as that. We’ve got our panniers packed, a horrible map and a good attitude and we’re setting out any minute now. We’ll see where the trip takes us. We’re both sad to leave our cozy bed and gracious couch surfing hosts in Hanoi but excited to visit one of Margaret’s Vietnamese friends in her hometown of Bac Giang. 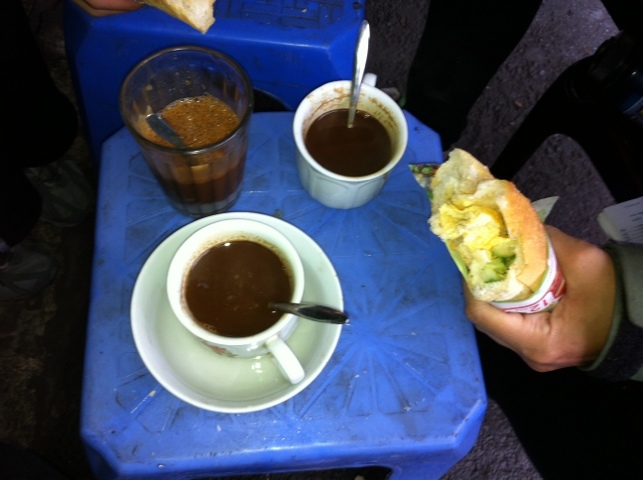 We had a hearty breakfast of Banh my (fresh baguette with scrambled egg, cucumber and spicy sauce) and a tiny cup of STRONG vietnamese coffee with sweetened condensed milk. I know that you will have a great time and it will probably be very different from our time there. Looking forward to your terrific blog as you continue your trip and may the good weather gods be with you.